If you're a commuter in London, you probably spotted our latest advertising campaign today. It might have been handed to you as you came out of the tube, or perhaps it was on the café counter when you grabbed your morning coffee. 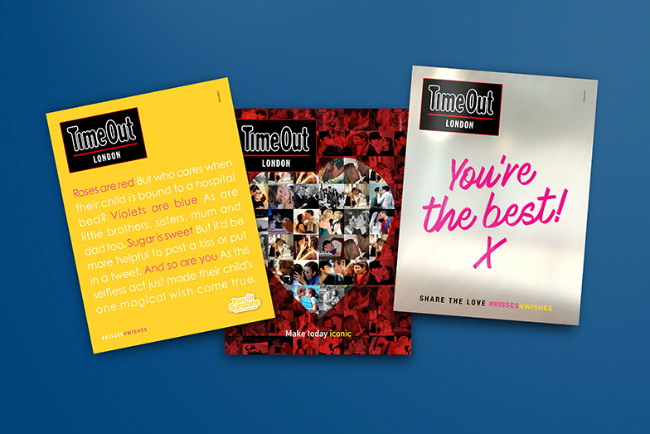 As a business that works with healthcare and pharma companies, it's not often that we get the opportunity to design the cover for Time Out London, so we jumped at the chance to partner with Rays of Sunshine to help them get the word out about their #Kisses4Wishes campaign on Valentine's Day. Content Marketing Manager Liz Inskip talked with the creative team about the campaign and how BLH approaches this kind of work. "This was an exciting opportunity for us as a creative team, because there's so much you can do with the cover of a publication like Time Out London. It's a nice change of pace as well, as we normally work in a highly regulated, restricted industry – we got to let our hair down creatively on this project. It's the Valentine's Day cover, which offers an opportunity to really pull on the emotion of the day. In order to find the right approach to the creative, we started with strategy. Head of Brand Strategy Jenna Earl came on board early, and was able to tease out a proposition that hit the sweet spot for the charity and our target audience." Once the team had a strategy and an understanding of how to approach the brief, they went straight to work developing a series of creative concepts, narrowing down it down to four routes that were then presented to Rays of Sunshine. It was important that the final creative be memorable, really stand out and entice someone to pick up a copy of Time Out, and tell the #Kisses4Wishes story in a way that moves that person to dig out some change or text in a donation. "The first concept was really relevant to the cultural heritage of Time Out and its audience. We created a heart-shaped montage of iconic kisses – everything from the dogs in Lady and the Tramp to the Titanic kiss, from the historic V-Day kiss to the upside down Spiderman kiss – it touched on memorable moments in history and pop culture. Inside the cover wrap, we asked people to recreate these iconic kisses and share to support #Kisses4Wishes. By showing people what we needed them to do, the campaign became a little easier to join in and have fun with – making it more likely to be passed on." "The campaign would have got a lot of traction, it was very appropriate to the audience, but we did feel it was perhaps a bit too Time Out focused and not bringing the Rays of Sunshine brand to the front enough. We decided that while it was suited to Time Out London, it wasn’t quite right in terms of building campaign awareness for Rays of Sunshine." Concept 2: "Roses are Red…"
“The second concept centred around the widely known ‘roses are red, violets are blue’ poem. By attaching ourselves to something so overtly ‘Valentine's’, we were attracting people with something expected. But to engage them we had to give them something unexpected – so we turned the poem into a longer, more emotive story that spoke to the Rays of Sunshine cause. The whole point was to put the meaning back into a day that’s become a bit meaningless and superficial. "We wanted to find a way to disrupt the expected Valentine’s message with something more heartfelt and hard-hitting. The juxtaposition of the jokey ‘who fancies who’ side of Valentine's Day against the idea of real love – sending love to children facing life-threatening illness in hospital – was something that would resonate deeply with our target audience. However, while we all agreed that this cover might solicit more donations on the day, it wasn’t something that could be used again because it’s so Valentine's Day focused." Concept 3: "Share the Love (Mirror)"
"Our third concept centred on a bigger idea of sharing the love, in this case by passing on a compliment – people who feel good do good and will be more likely to want to keep this positivity going. We designed a mirror board with compliments like ‘you're amazing’ and ‘you're wonderful’ written on it in lipstick. Part of the inspiration for this was Caitlin, who came up with #Kisses4Wishes as a thank you for having her own wish granted by Rays of Sunshine." "From a creative perspective, we really liked the idea of having a mirror board on the cover for the impact – it was an exciting idea as it’s such an unusual treatment for a magazine. The concept was also very in line with the message around ‘real love’ we wanted to tap into, and steers clear of any stereotypical Valentine's Day messaging. Unfortunately, the mirror boards were going to be too difficult to make happen on a practical level. We needed to offset the impact of the design against the fact that Rays of Sunshine are a charity, and the increase in production costs made it less effective for the purpose of raising money for wishes." Concept 4: "Share the Love (Kisses)"
"The final concept, and the one that was selected, was to put the kisses in #Kisses4Wishes at the heart of the campaign. We made them the hero of the piece, inverting the Rays of Sunshine brand colours to create an identifiable ‘yellow lips’ device that can be used again in other campaigns. 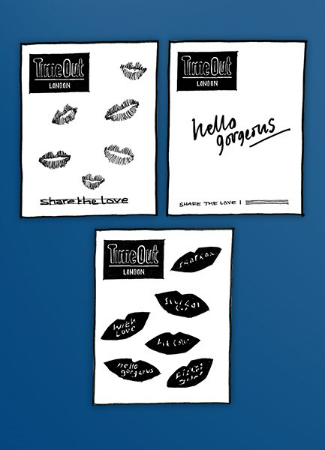 Whilst we couldn’t print actual stickers on the cover, we have produced stickers of the lips that people can pass on and wear. It’s a lovely, sweet, sharable campaign that makes a direct visual connection between a kiss and a donation." "It starts with a kiss, literally. By showing the consequences of each kiss (i.e. wishes previously granted), we're putting real meaning behind them – they're no gimmick. Now people have a compelling, evidence-based reason to share kisses and support the campaign. We want to help show how a small act of love really can go a long way." "The turnaround time on the campaign was quite tight for #Kisses4Wishes – we had about four weeks from when the brief came in until we needed to deliver the final cover design. It went very smoothly, though. One of the great things about working with Rays of Sunshine was that we really had their trust from the beginning, which allowed us to approach the challenge the way we would any other with strategy and creative working side by side. For a charity, advertising can often be quite reactive, leaving little time to strategise. At Blue Latitude Health, we're always thinking, even about the finer details. For example, when developing the cover wrap, we had a lot of space we could use, so we spent some time thinking about message flow and how to communicate the details of the campaign in a way that kept the outside cover really clean. Having the inside covers allowed us to tell a much fuller, richer story about the campaign and expand on how people could get involved." "Exactly. Despite the short timelines, we were rigorous with this campaign and took our time to get the strategy right for Rays of Sunshine. Nailing down a strategic approach is essential for a focused and productive creative process – and here it was the reason we were able to produce four creative concepts of merit. And what was really nice for us, something you always strive for as a creative, was that they genuinely liked all of them. It was split both on the Blue Latitude Health and Rays of Sunshine sides as to which campaign to run because they all worked.In the end, the ‘Share the Love (Kisses)’ campaign won out because it hit just the right note – using the power of love rather than any romantic connotation – as well as offering Rays of Sunshine campaign elements that they can continue using after Valentine's Day. For a charity, that kind of longer term value is incredibly important." Thanks to Philippa and Damien for sharing their experience working on the #Kisses4Wishes campaign. If you missed out on a copy of Time Out London, you can see the campaign on Twitter, Facebook, and Instagram. And we encourage everyone to take a few moments to visit the Rays of Sunshine website or text KISS03 £3 to 70070 to donate £3 and make a young person’s wish come true.